In most professions, the first day is the “training day,” and it is the easiest day of one’s employment. 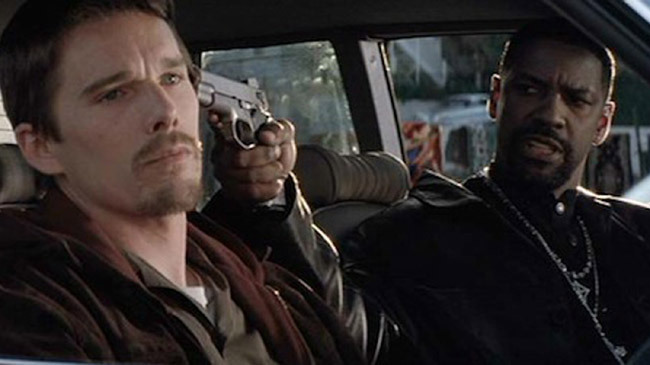 For officer Jake Hoyt (Ethan Hawke), his Training Day (unbeknownst to him) may be his last day as a living human being. Jake is looking to get into the undercover unit, and his final evaluation involves his observation and participation under the watchful eye of veteran detective Alonzo Harris (Denzel Washington), a man who knows the streets of Los Angeles like the back of hand. In Alonzo’s mind, precarious streets call for questionable and equally precarious methods. It becomes apparent quickly that this is not what Hoyt was expecting. In the City of Angels where danger is prevalent at every corner, the biggest danger Hoyt may have to deal with could be the very man he is supposed to learn from. This is Officer Hoyt’s day of reckoning. Let’s face it. Police corruption isn’t a foreign concept in movies, and it never will be. It is an common subject to fall upon and explore within a movie, and it is at the crux of Training Day. When is the line crossed? Should the line be crossed (within reason) if it begets results? These are common threads found in other works, and they are found here, making Training Day a pretty basic story when you think about it. With that said, it is a very compelling watch, with almost all credit attributed to Denzel Washington and Ethan Hawke. There isn’t much more that can be said for Denzel’s performance in this. Simply put, it is one of the better performances of the 21st century in my humble opinion. The great thing about it is that up to that point in time, Denzel never did anything in his filmography like his portrayal of Alonzo Harris, and it is clear to see that Washington has the time of his life in the role. Alonzo is equal parts charismatic, comical, reprehensible, and intelligent, sometimes all at once. And even though his character is a bad person all in all, Denzel and the writing for the film as a whole do a wonderful job of taking a semi-slow burn to things. On my initial viewing years back, it wasn’t until a certain point in the film where his character was utterly unredeemable, and that is quite the job done by everyone involved to toe the line just enough to still see his point of view in certain situations. Know how every Oscar winner has one moment that is shown in the “and the nominees are” moment of the show? There are easily four, five, or six scenes featuring Denzel that could have been shown there. It still may be Washington’s best role to this point in his career. A villain needs a hero to play off of though, and Ethan Hawke is no slouch here and just as deserving of praise. In some respects, Hawke’s role as Jake is harder than that of Denzel’s despite not being as dynamic. Hawke has to sell his character’s naivete in a reactive state more times than not and doesn’t get to shoot off at the hip like Washington’s. But he’s so great and so intense when the script calls for him to stand his ground. Additionally, he is just so easy to get behind because we have all been in the same situation that Hoyt finds himself in, being in that we want to desperately have something or be something so bad we’ll do damn near anything to make it happen. He’s a good guy that has his preconceived notions flipped immediately, and Hawke captures the struggle as well as anyone could. Whether in a car, a diner, or on a bust, Training Day is at its best when Washington and Hawke are allowed to just carry things on their shoulders, which is fortunately most of the movie. There are other supporting characters with thankfully very little to do, as many of these bit actors are musical artists who aren’t exactly natural on screen. For most the runtime, the movie is conventional in a story progression sense and it does what is needed to move along the story in a respectable way. It is only in the second half of the movie where the writing takes a step back, mainly on reliance to a specific plot device and coincidence. With a film so gritty and uncompromising, how the last third syncs up with the rest of the film comes off more incongruent than it should. On multiple watches, it is the type of moment that is analyzed more and more in a nitpicking fashion as opposed to the first watch. Antoine Fuqua is at the directorial helm here, and while there isn’t a ton of cinematic flair involved aside from an underrated ending fight, his nails the feel and tone of inner city Los Angeles. No easy route was taken, like filming in New Mexico and passing it off in the movie as LA. Everything is shot on location, with many scenes in the literal heart of no man’s land (Crenshaw and Baldwin Village). To further add to the authenticity, actual gang members were cast in exchange for using the location for shooting, so things feel as real as they could in a controlled movie setting. It is a level of commitment to this that shouldn’t go unnoticed. 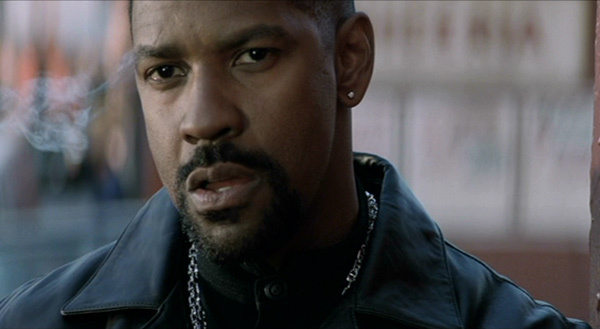 Training Day is one of the better crime movies around only with the smallest of flaws, presenting a simplistic yet gripping story raised to tremendous heights by the work of Washington and Hawke. 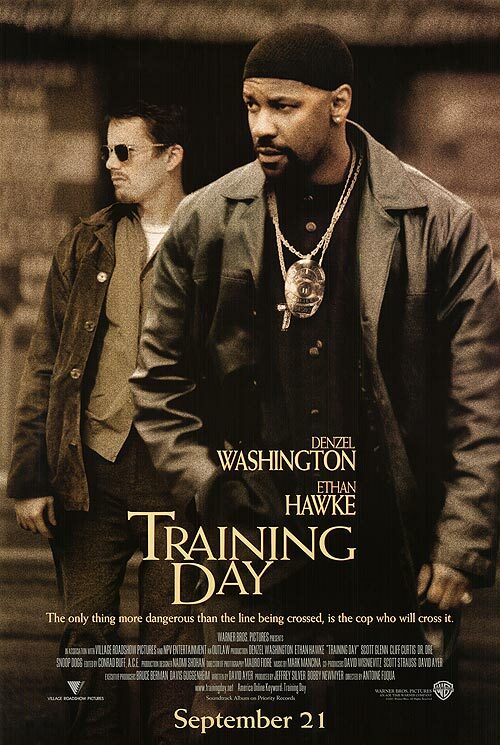 It is not a training day I’d want to subject myself to even once, but it is a day I’d gladly rewatch again and again. Photo credits go to movieposter.com, totalfilm.com, hotflick,net, and filmjackets.com. Great review and i know the exact ‘coincidence’ you’re talking about. I love this film however it includes one of the worst pieces of acting ever seen, as demonstrated by Dr Dre! Agreed! Macy Gray was slightly better, but I laugh uncontrollably when Dre and Snoop appear and act in the movie. It’s so awesomely bad! Wow. Nicely done. Great review. Thanks for the feedback. I think most would agree with my opinion here. It never gets old. Washington and Hawke make this movie such a better watch. Without them, this would have just been another, conventional cop-tale. Good review. You’re right. It isn’t groundbreaking but firmly up there in cop corruption movies, thanks to Denzel and Ethan. Thanks for the comment Dan! It’s a watch that is never dull! Hope The Equalizer is an entertaining watch as well. Still one of Denzel’s and Ethan’s better roles. Thanks for the comment! Thanks Rob. I don’t think it would be as awesome without career performances by Hawke and Washington, but they are reason to come back to this from time to time, for me at least.